Sturge- Weber syndrome More Details, an encephalo-trigeminal angiomatosis is a rare, congenital neurocutaneous syndrome characterized by unilateral facial cutaneous vascular malformation (port wine stain) associated with ipsilateral leptomeningeal angiomatosis involving parietal or occipital regions. It occurs with a frequency of approximately 1 per 50,000. It presents with focal seizures and recurrent episodes of transient hemiparesis either due to acute vascular events or of postictal in origin. Differentiation between both is must, as former improves with aspirin. EEG helps to differentiate the exact etiology. We here report a 25-month-old male child born by full-term vaginal delivery presented to us with sudden onset of left-sided hemiparesis lasting 2 hours, not preceded by constitutional symptoms or seizure activity. He had similar episodes of transient hemiparesis on either side in past which relieved spontaneously without any neurological deficit. First episode of right-sided focal seizures occurred at age of 4 months. Frequency of seizures increased and child was started on antiepileptic drugs. Since age of 11 months, child had recurrent episodes of transient hemiparesis on either side with or without associated seizures, lasting 2-3 days and relieved by itself. There was history of developmental delay noticed after the age of 4 months and presently he could only walk with support corresponding to developmental age of 11 months. On examination he was afebrile with normal vitals. There was port-wine stain of 4 × 1 cm in an atypical site involving midline of forehead extending over nose [Figure 1]. His modified GCS was 13/15, had UMN type left facial nerve palsy with left-sided hemiparesis. Rest neurological and systemic examination was unremarkable. 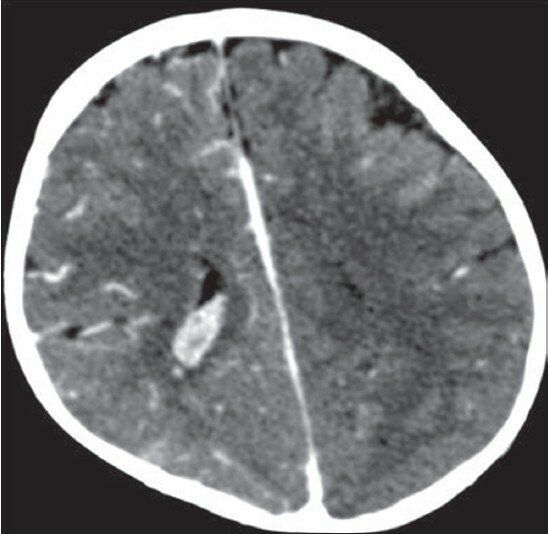 Contrast CT scan of brain showed linear hyperdense area in right high parietal lobe with gyriform enhancement along with enlargement of right choroid plexus and left frontal atrophy [Figure 2] and [Figure 3]. EEG done urgently revealed no ictal activity, excluding postictal hemiparesis. PET scan revealed hypoperfusion and decreased metabolism in cortex surrounding the leptomeningeal angioma. Therefore the hemiparesis was presumed to be of vascular in origin. Child was started on aspirin to prevent further recurrences of these thrombotic events. On 3 rd day of admission, child developed right-sided tonic clonic seizures with facial twitching lasting 15 minutes, and loss of consciousness followed by right-sided hemiparesis. Meanwhile his hemiparesis on left side improved. A concurrent EEG revealed epileptic activity with focus on left side, suggesting hemiparesis of postictal origin. Seizures were controlled with antiepileptic drugs. Child remained seizure-free thereafter until discharge and his residual deficits resolved within 24 hours. On 6 th day of admission, child was discharged on anticonvulsants and aspirin prophylaxis. On follow-up up to 1 year, both of these hemiparetic episodes and seizure frequency decreased. Features suggestive of Sturge-Weber syndrome More Details in this child were facial port-wine stain, focal seizures, hemiparesis or paroxysmal vascular events and neuroimaging findings. SWS is a phakomatosis  characterized by port-wine stain over trigeminal nerve area, leptomeningeal angiomatosis and ocular abnormalities caused by abnormal persistence of embryonal vascular system, which is localized around the cephalic portion of neural tube. Typically patient presents at birth with facial angiomas. Angiomas involving ophthalmic division of this nerve have a high chance of associated SWS. Normally this vascular plexus forms in sixth week and regresses around ninth week of gestation. Failure of normal regression results in residual vascular tissue, which forms angiomata of face, ipsilateral eye and leptomeninges. Neurological dysfunction results from secondary effects on surrounding tissue, including hypoxia, ischemia, venous occlusion, thrombosis, infarction and vasomotor phenomenon. E S Roach classified the encephaloangiomatosis into three types. Type I (classic) is the common form with both facial and leptomeningeal angiomas and glaucoma may be present, type II with facial angioma and glaucoma but without evidence of intracranial disease and type III with leptomeningeal angiomas without facial nevus with usually no ocular manifestation. , Gracia et al. and Gomez  reported that venous occlusion might actually cause the initial neurological event, either a seizure, transient hemiparesis or both, thereby beginning the process of "vascular steal phenomenon"  developing around the angioma, resulting in cortical ischemia. Recurrent seizures, status epilepticus, intractable seizures and recurrent vascular events may aggravate this steal further with increase in cortical ischemia, resulting in progressive calcification, gliosis and atrophy, which in turn increase the chance of seizures and neurological deterioration. Neurological outcome in SWS ranges from minimal or no neurological signs to devastating impairment with uncontrolled seizures, hemiparesis, visual field defects and progressive mental retardation. Seizure is a common feature, often occurs during first year of life and results from cortical irritability caused by angioma through the mechanism of hypoxia, ischemia and gliosis. About 80% of affected persons have focal seizures involving the contralateral side of the port wine stain. Developmental delay and mental retardation are almost always associated with seizures. Hemiparesis occurs in 25-56% of patients. As postictal event may also present as hemiparesis, it is important to differentiate the two. EEG on arrival of patient helps to distinguish the two. PET and SPECT scan can also guide to differentiate both, which can reveal decreased perfusion and metabolism during vascular event. MR angiography also reveals thrombotic events. Cranial CT in a patient with SWS demonstrates abnormal contrast enhancement of angioma. Cortical atrophy underlying the angioma with gyriform "tram track" calcification is characteristic imaging feature. Calcification is unusual before 2 years of age, usually involves high parietal or occipital lobes. MRI is the "gold standard" for diagnosis of disease. MRI demonstrates thickened cortex, decreased convolutions, abnormal white matter and gadolinium enhancement of leptomeningeal angioma. Management of SWS includes treatment of seizures and glaucoma. Hemiparetic episodes of vascular origin should be treated with aspirin. Aspirin prophylaxis reduces these vascular phenomenon, thereby such episodes of transient hemiparesis and overall neurological deterioration. Any child with a facial nevus and hemiparesis with or without seizures and/or glaucoma should arouse a suspicion of SWS. 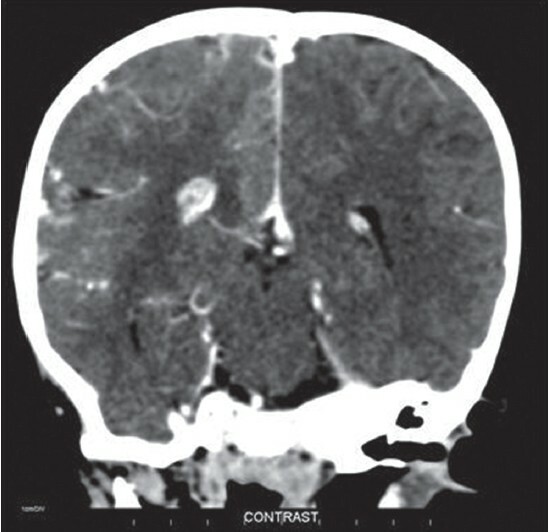 Immediate neuroimaging can reveal the diagnosis. EEG helps to differentiate between postictal hemiparesis and paroxysmal vascular events. The latter responds to aspirin, thereby decreasing the recurrences and overall neurological deterioration. 1. Baselga E. Sturge-Weber syndrome. Semin Cutan Med Surg 2004;23:87-98. 2. Thomas-Sohl KA, Vaslow DF, Maria BL. Sturge-Weber syndrome: Areview. Pediatr Neurol 2004;30:303-10. 3. Berg BO. Neurocutaneous syndromes: Phakomatoses and allied conditions. In: Swaiman KF, Ashwal S, editors. Pediatric Neurology Principles and Practice. Mosby Inc Co.; 1999. p. 530-50. 4. Aydin A, Cakmakçi H, Kovanlikaya A, Dirik E. Sturge-Weber syndrome without facial nevus. Pediatr Neurol 2000;22:400-2. 5. Girija AS, Somanath V. A case of hemeplegic migraine with leptomeningealangiomatosis. Neurol India 2002;50:522-3. 6. Garcia JC, Roach ES, McLean WT. Recurrent thrombotic deterioration in the Sturge-Weber syndrome. Childs Brain 1981;8:427-33. 7. Gomez MR, Bebin EM. Sturge-Weber syndrome. In: Gomez MR, editor. Neurocutaneous Diseases: A Practical Approach. London: Butterworths; 1987. p. 356-67. 8. Haslam R. Neurocutaneous syndromes. In: Behrman RE, Kliegman RM, Jenson HB, editors. Nelson Textbook of Pediatrics. 17 th ed. Philadelphia: WB Saunders; 2004. p. 2015-9. 9. Chugani HT, Mazziotta JC, Phelps ME. Sturge-Weber syndrome: A study of cerebral glucose utilization with positron emission tomography. J Pediatr 1989;114:244-53. 10. Benedikt RA, Brown DC, Walker R, Ghaed VN, Mitchell M, Geyer CA. Sturge-Weber syndrome: Cranial MR imaging with Gd-DTPA. AJNR Am J Neuroradiol 1993;14:409-15.